Pittsford has many fine attributes – its history, its architecture, its traditions and it has one more thing that is uniquely Pittsford. 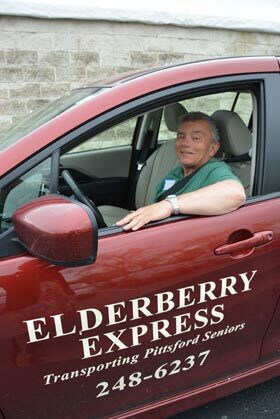 It is the enviable service to seniors called the Elderberry Express. The service was born in 1987 out of a task force on aging. The task force included seven Pittsford churches as well as businesses who discussed the greatest needs facing residents over 55. Transportation ranked as the number one need. It was found that there were many people over age 55 who lived alone and had given up their automobiles, either due to the associated expenses or because the individual no longer felt competent to drive. The idea for a seniors' transportation service was born. Monthly meetings were held to determine policies, solicit funds, and recruit members who were willing to give of their time and money to drive or answer the telephone requests. A 12-passenger van was made available through the generosity of R.J. Russell Associates who paid for the leasing of the vehicle for two years. On August 4, 1987, the van was christened Elderberry Express. Usage was slow to build at first, but when transportation to the Pittsford Seniors meetings on Tuesdays was offered as well as shopping trips to Wegmans on Wednesdays, ridership increased dramatically. Even though donations from the community, the clients, and the churches were substantial, they were not enough to sustain the growing costs of insurance, gasoline, and maintenance of the vehicle. So after becoming incorporated as a not-for-profit organization in 1990, Elderberry Express received its first grant from the Town of Pittsford. Elderberry Express still depends upon donations from riders, families and friends to support the two vehicles that now are the "fleet" to transport seniors to their appointments. Elderberry Express has one paid part-time executive director who takes the phone calls, finds drivers, and sets appointments. The volunteer Board of Directors is comprised of members from the community, the churches and other interested volunteers. A total of 65 volunteers support the organization and there is always the need for more.